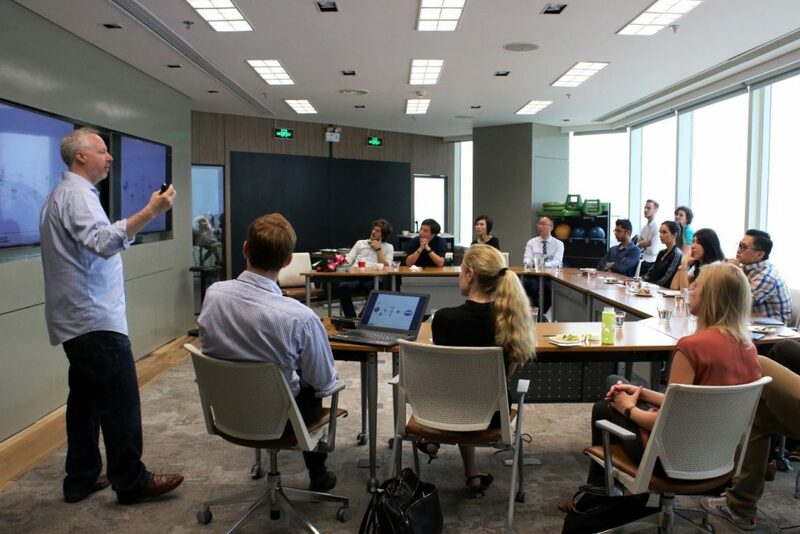 This week, we hosted a workshop on “Closing the loop on Waste in China” for 20 sustainability professionals from various industries, to help them understand the waste management system in China and how they can engage their stakeholders in the circular economy. Focusing on the circular economy of waste, and how businesses hold the power to address the waste issue in China and the potential for them to become a solution provider, we invited Monique Maissan, Founder and CEO of Vision Textiles and Waste2Wear and Antonio Roade, Sustainability Manager at Inditex to talk about how they were employing closed loop principals. “I’m wearing 16 bottles!” Monique started off her talk by introducing the bright green dress that she was wearing, a product of Waste2Wear. The dress was made from sixteen plastic bottles that are processed to become fabric. Every Waste2Wear apparel has a tag with a QR code that tells a customer the amount of recycled materials used and answer any queries they have. Waste2Wear focuses on creating sustainable textiles products using recycled plastic bottles and through that raise awareness about sustainability. Monique introduced the Plastic Catch Project in Hong Kong, where Waste2Wear partnered with Ocean Recovery Alliance to help remove litter from the oceans. Fishermen simply need to bring an extra fishing net whenever they go out to fish, and collect plastic waste from the sea. The collected plastics are then exchanged with cash or coupons sponsored by companies who generates big amounts of plastic bottles. This project serves as a good case study for other companies who want to engage with the entire circular economy because many stakeholders are involved in this project. Both the community and the company becomes the solution. Similarly, Inditex are also focused on making every part of their circular system sustainable. This meant from the raw materials they used to produce the apparel to its logistics and distribution process to the product’s end of life and even taking it a step further to the product’s next use. 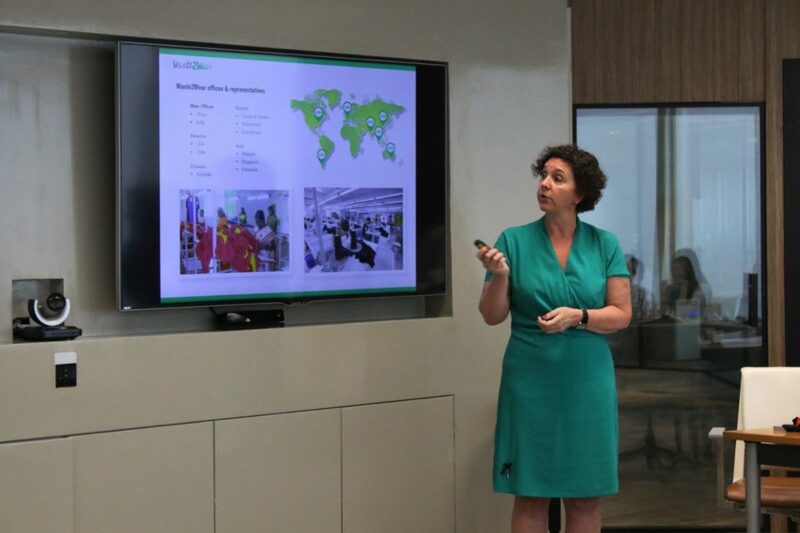 For example, Inditex has a “Zero Waste to Landfill” program in the logistics team where they aim to redesign, reuse and recycle cardboard boxes. To engage stakeholders in the circular economy, a company can collaborate with other brands that has similar beliefs to reach out to a larger target audiences and raise more awareness for their cause. For example, Waste2Wear partnered with Ochsner Hockey to produce the jerseys that the national hockey team of Switzerland wore for the finals of the Swiss Ice Hockey Challenge. Ochsner Hockey like Waste2Wear is committed to sustainable textiles. Waste2Wear also co-brands with Unilever and Target. Besides producing beautiful apparels from plastic bottles, a unique thing about Waste2Wear is that they created a patented Recycling Assurance, an exclusive 3-step assessment process to verify the content of recycled plastic bottles in their products chemically. This allowed the company to control the quality of the products as it scales. Hence, their customers can be assured that what they bought is indeed made up of recycled plastic bottles. Also, they profit from selling this technology to other companies. Like Waste2Wear, Inditex also has a textile recycling research program that is in collaboration with MIT Massachusetts Institute of Technology (MIT) and specific Spanish universities. They aim to create new and more sustainable textiles. One of the textiles is Refibra™, a fibre made up of recycled cotton from the recycled clothes collected in various stores such as ZARA and sustainable wood. This is one of the ways to create a closed-loop production cycle. Through the use of sustainable materials, Inditex is at the forefront of the textile and the retail industry. With investments in research and development, not only can companies reduce waste, in the long run, it translates to profits through branding and saving resources. Tags: business, China, stakeholder engagement, waste.